A small group of Dechen Sangha members have just returned from a two-week visit to Sakya Changlochen Ling in the Dordogne region of South-West France, where they were putting the finishing touches to the latest building project. 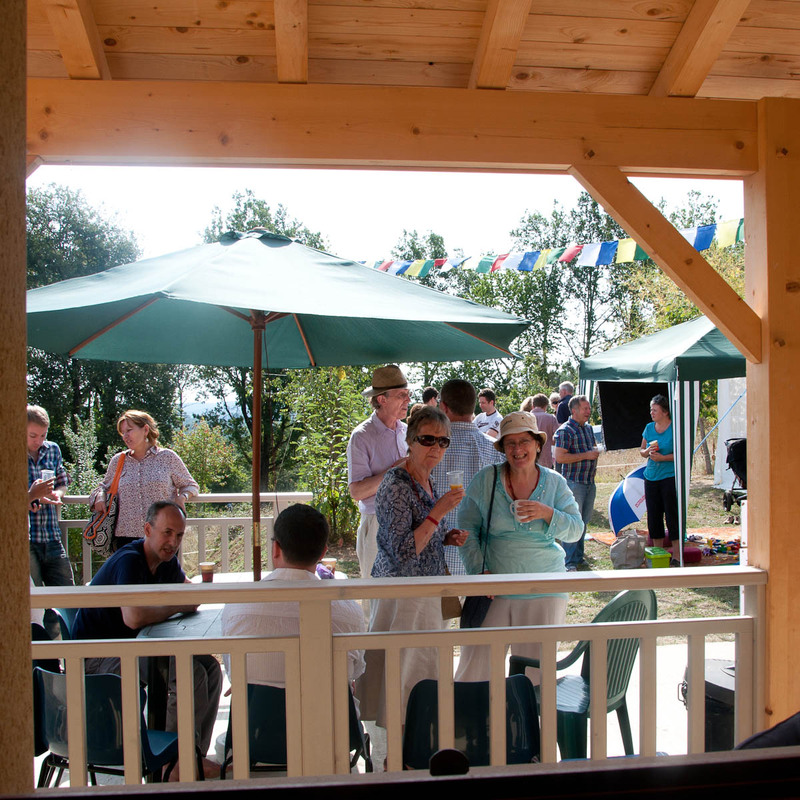 The work comprised installation of a large new kitchen, interior and exterior decorating as well as the usual grass cutting. It marks the completion of the building project which began two years ago, and has created a high standard of living space for visiting Lamas, such as H.H. Sakya Trizin. The new kitchen will provide an invaluable resource for Sangha members, and in particular, for the Dechen Diner during the summer course. 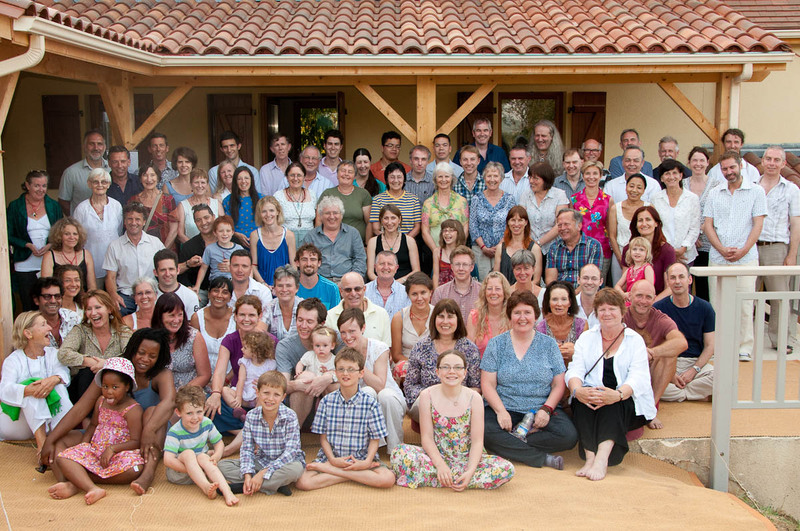 The building can also facilitate small group retreats the first of which has been scheduled for May of this year, when a group from the German Dechen community headed by Wolfgang Staufner, co-ordinator of Dechen’s Stuttgart centre, will spend a week there doing a ngondro practice retreat. The only work remaining on this project (for the time being) is the external tiling of the covered terraces, which can only be done after the last frosts of the year, and the positioning of the golden genzera on the roof. All this will be completed soon. A brief photo album of the working party can be seen by following this link. It is hoped that as many people as possible will be able to come and see the results of this work for themselves in August when Lama Jampa will be teaching the second part of Sakya Pandita‘s ‘Elucidating the Thought of the Sage' followed by a one week retreat on Vajrapani Bhutadamara. Please click here for further details of the course. 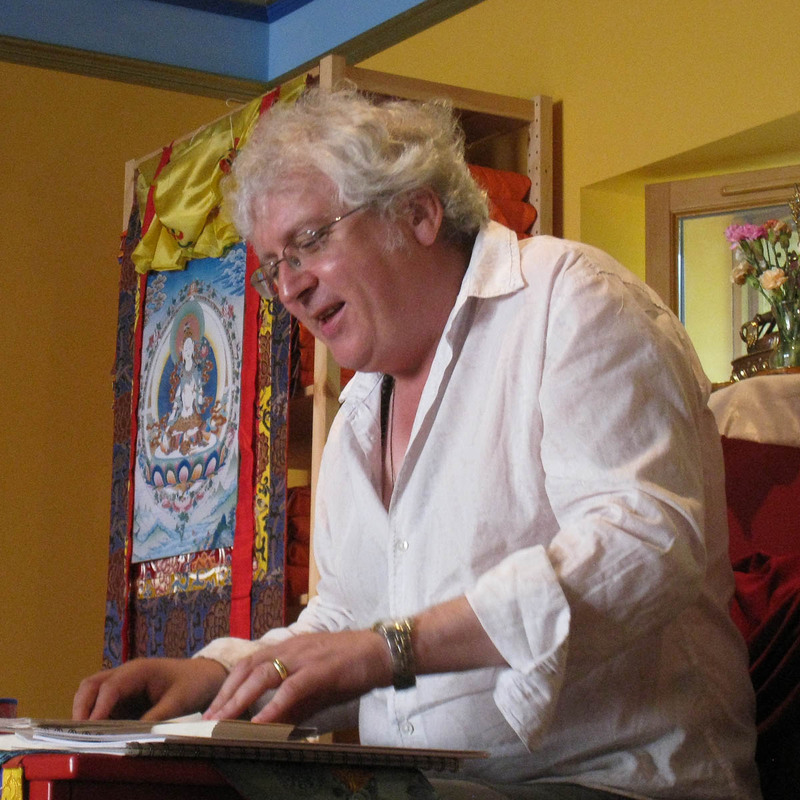 Lama Jampa Thaye has just completed a weekend of teaching on the Madhyamaka philosophical system at Dhakpo Kagyu Ling, the French seat of His Holiness Karmapa Thrinley Thaye Dorje. Around sixty five people, monks, nuns and lay people attended the teachings. Lama Jean Guy the president of the Dhakpo association gave a very warm introduction in which he referred to Lama Jampa Thaye’s role in protecting the Karma Kagyu tradition in England. 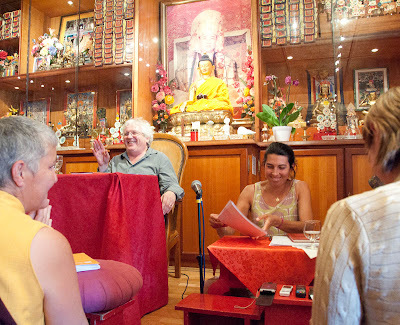 Lama Jampa has spent three weeks in France where he has been staying at Sakya Chang-lo-Chen Ling. During this time he has taught the first part of Sakya Pandita’s seminal work on Lam-Rim, Elucidating the Thought of the Sage and bestowed the initiation, tri and lung for White Tara Chintamanichakra one of the key longevity deities of the Sakya school. Following this Lama Jampa led a retreat on this deity. At the start of his stay in France, Lama Jampa, attended teachings given by His Holiness Karmapa at Dhakpo Kagyu Ling. His Holiness’ programme which included several days of teaching from Shantideva’s text, The Way of the Bodhisattva culminated in the initiation of Chenrezik from the lineage of Atisha. Over 1,000 people attended the course. 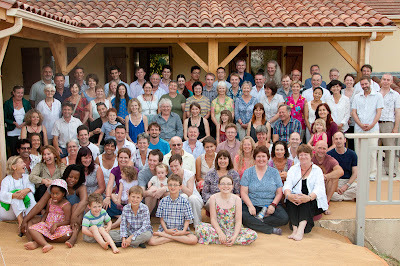 To view photo galleries of the events please click here. 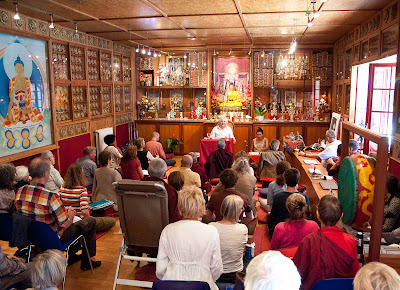 Subsequently, Lama Jampa and Dechen Dolma travelled to Dhakpo Kundreul Ling, the main Karma Kagyu retreat centre in the Auvergne region. Here they spent time with His Holiness and received the initiation of Dorje Bernagchen. His Holiness has now completed his European tour and will be returning to Delhi on Monday September 3rd. 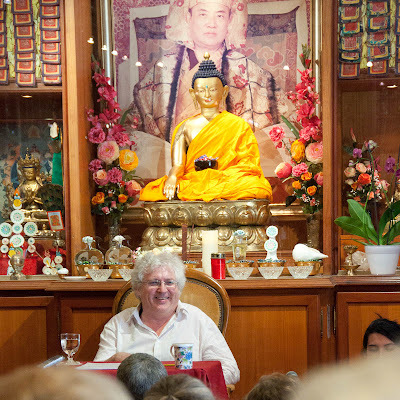 The annual summer retreat at Sakya Changlochen Ling in France began on 19th August, when Lama Jampa Thaye started teaching Sakya Pandita’s renowned work “Elucidating the Thought of the Sage”. Over 80 people gathered daily to hear this seminal text which clarifies the essential Buddhist teachings, tracing them back to their original sources. 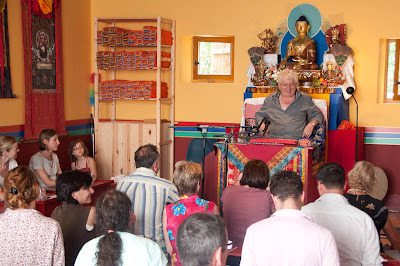 The first part of the teaching concluded on 24th August, and Lama Jampa will continue to teach this text next year. 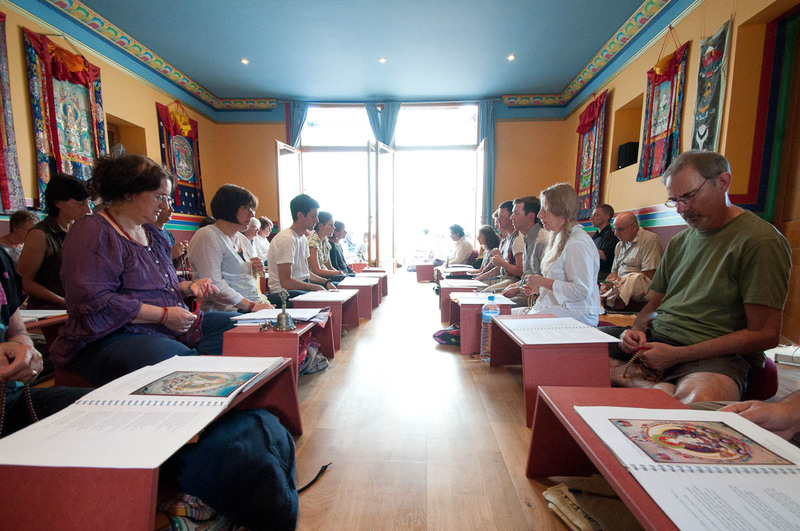 The retreat is continuing until 31st August with daily meditation practice sessions on White Tara. 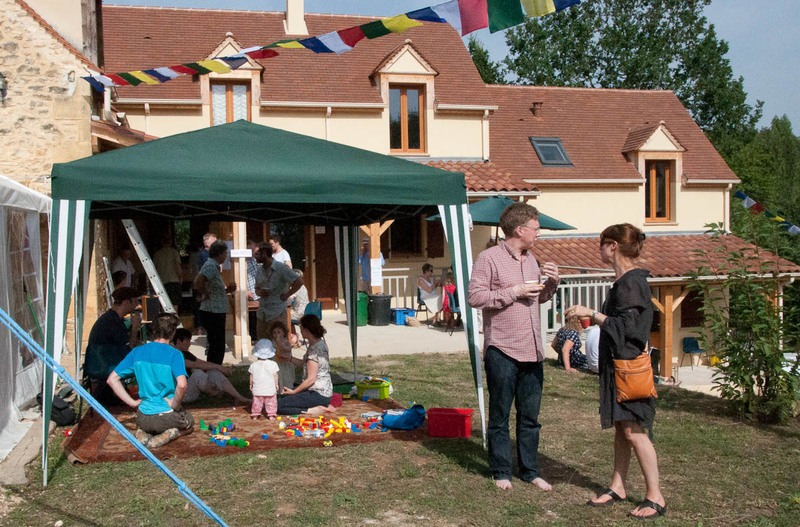 For most of the attendees, this was their first chance to see the considerable development of the property over the last two years, which has been supported so generously by members of the Dechen Community and beyond.